Originally called Ward’s Folly by those who doubted its durability, Ward’s Castle in Rye Brook, NY still stands as a testament to modern concrete architecture. Designed and erected between 1873 and 1875 by engineer William E. Ward and architect Robert Mook, the 17 room house was constructed using over 36,000 barrels of reinforced cement. No attempt was made to disguise the unlikely building materials; instead, the inventive pair of builders did everything they could to prove that concrete could be used in new and innovative ways. The structure is decidedly regal, featuring a four story octagonal tower, different colors of concrete, and mansard roofs. Only the window frames, paneling, and doors were built using wood. It served as Ward’s family home for four generations and earned a spot on the National Registry of Historic Places in 1976. In 1977, the building was bought by Mort Walker and converted into the Museum of Cartoon Art. It remained as such until 1992, when the museum was relocated to Boca Raton, FL. 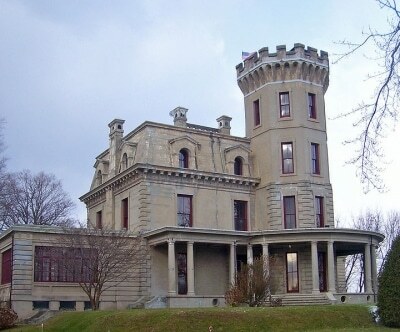 Ward’s Castle remains a private residence and an unparalleled architectural masterpiece to this day. Ward’s Castle paved the way for modern reinforced concrete construction, which employs a large number of professional construction tools, such as rebar cutters and rebar benders.